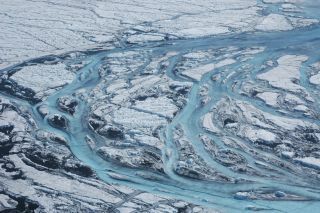 Each summer, large rivers emerge on the surface of Greenland, swiftly sending meltwater from the ice sheet into the sea. Surface melt from the icy island has increased 50 percent in the last 20 years compared with the early 1800s, before the industrial era, researchers report today (Dec. 5) in the journal Nature. The runoff alone is now contributing about a millimeter to the global average sea level per year, said study co-author Sarah Das, a glaciologist at Woods Hole Oceanographic Institution. Scientists tracking Greenland's ice by satellite and on the ground have seen increasingly dire ice loss. Greenland loses ice both when icebergs calve off glaciers and when ice on the surface melts and flows to the sea as water. The meltwater flow is how the majority of the ice vanishes, and that's what Das and her colleagues focused on. The numbers weren't good. The last two decades of melt show an increase in the rate of melting of 250 percent to 575 percent compared with the preindustrial baseline from before the mid-1800s. The researchers found that the rate translated to a 50-percent increase in the runoff of meltwater into the sea compared with the preindustrial era. Over the 20th century alone, the runoff of meltwater increased 33 percent. "We show that although melt started to increase around the pre- to post-industrial transition, it really stayed fairly low and stable until about the 1990s," Das said. "So, it's really been in the last couple of decades that we've seen this exceptional rise." The year 2012, in particular, was a standout for ice melt. Researchers knew that the Arctic lost an unprecedented amount of ice compared with earlier decades in that year, but Das and her colleagues were able to show that more ice melted in 2012 in Greenland than in any of the previous 350 years. Because Greenland had been icy and cold for thousands of years prior, the researchers suspect that 2012 was a record for melt going back even further, to as early as 7,800 years ago. The amount of annual meltwater runoff from Greenland has increased from between 200 and 250 gigatons a year before humans started burning fossil fuels in large amounts to 350 gigatons a year today, Das and her colleagues reported. It takes about 360 gigatons of meltwater to raise the global sea level by a millimeter, Das said. At today's higher Arctic temperatures, each degree of warming causes about double the amount of melting that the same degree would have caused in the 1800s, Das said. That means that what humanity does now has a huge impact. "Every degree of warming going forward is going to have much larger implications for Greenland mass loss and sea-level rise," Das said. "Anything we can do to limit future warming, even by a little bit, is going to make a huge difference to keeping ice on Greenland and not in the ocean."